Dr. Salt completed her B.S. in Zoology and Anthropology from the University of Washington in 2001. 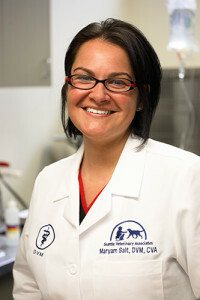 She earned her Doctor of Veterinary Medicine degree with honors from Washington State University in 2006, and then completed a medicine and surgical internship at VCA West Los Angeles Animal Hospital. In 2010 Dr. Salt completed Certification in Veterinary Medical Acupuncture through Colorado State University, and in 2015 completed a specialty internship in diagnostic imaging at a private specialty hospital in San Diego. Her professional interests include diagnostic imaging, internal medicine, geriatric pet care, and pain management. She enjoys volunteerism in the veterinary field locally and spent time in the South helping the animal victims of Hurricane Katrina. Originally from England, Dr. Salt now lives in North Seattle with a mixed breed dog Mugsie. In her free time she enjoys swimming, exploring the Northwest, traveling to sunny spots, learning to sail, and spending time with friends.